Yesterday I asked you to choose just one area of your life to focus on. Now, that doesn’t mean we are going to ignore the other areas of our lives. The simple truth is that we have to start somewhere, and we’re going to get the best out of this challenge by focusing on one main area at time. This will allow us time to focus and hone in on our top priorities in this area. Help us get a handle on this one area and carve out one zone where we can go and not feel scattered. By the end of this month I want you be able to approach your focus area feeling confident and happy about the progress you’ve made. That feeling will help you tackle your other areas – one step at a time! Today I’m going to share with you the magic of the three item to-do list and show you how it will help you get control of one area while still leaving you the time for others. 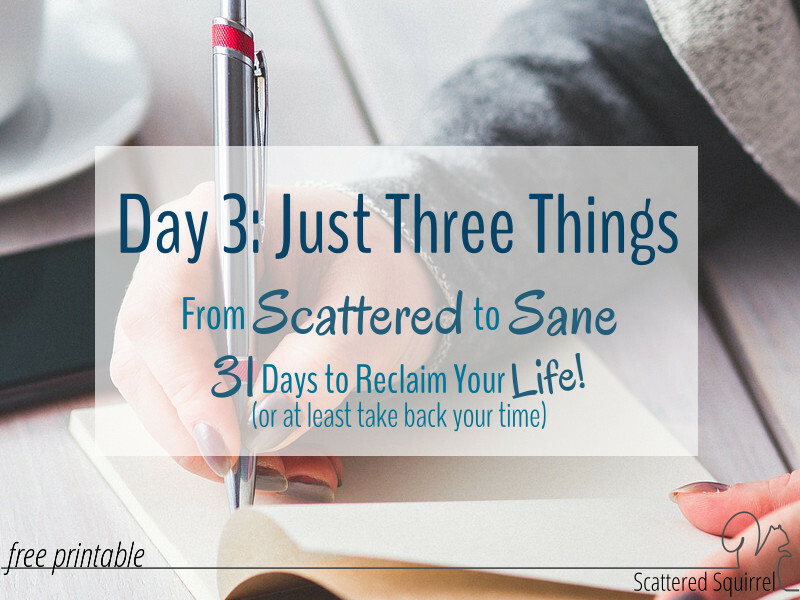 Welcome to day three of the From Scattered to Sane series. I use the three things rule or formula in many different ways in my time management systems. 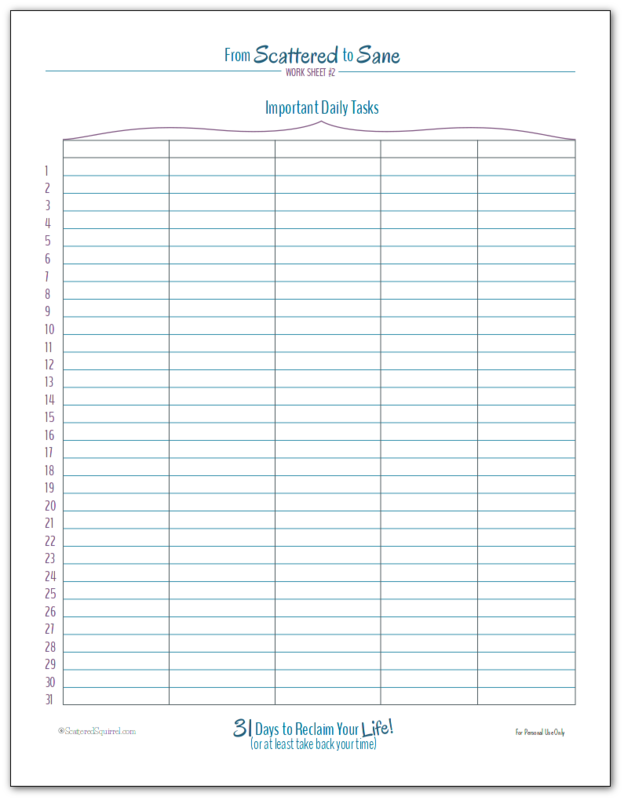 If you’ve used the daily or weekly to do list planner pages, you’ve seen the “My Top Three” sections. When it comes to to do lists, I really like the number three. I like three because it is a big enough number that it leaves you feeling productive and like you’ve accomplished something, (you have – three somethings to be exact) but it is also small enough not to be overwhelming. 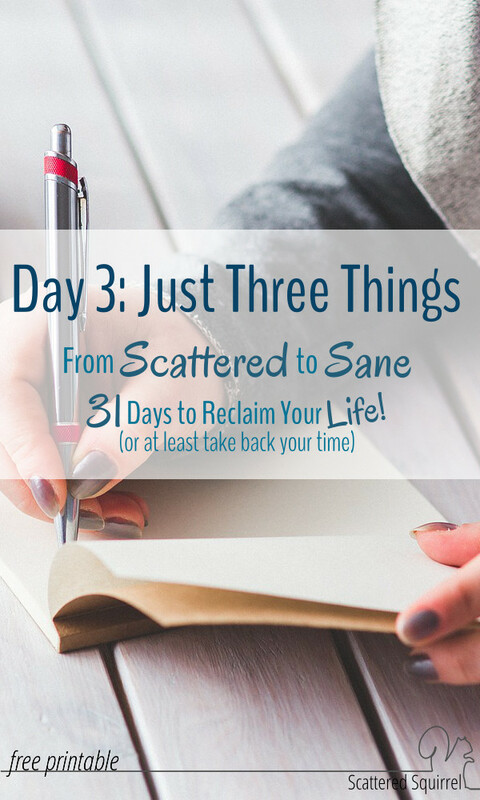 When you look at list of only three items, it is not overwhelming or daunting: it’s easily doable. How we feel when we look at our to do lists plays just as big a role in our ability to cross those items off, as the amount of time we have to do them in. Today’s step is to take a look at the area of our lives we want to focus on and make a list of all the things we need to do DAILY in this area. Take a few minutes to jot those down. I’ll wait. Now that you have that list in front of you, I want you take a good look at it and choose the three most important things on it. The three things that you need to do each day to keep that area of your life running smoothly. Remember, this is just step two, so think about it this way – if life went sideways on you tomorrow and you had to switch from normal every day routines into survival mode, what three things would you need each day (these are DAILY items) to do in your focus area to keep it running at a minimum. If you’re having a hard time deciding what you should choose for your top three, refer back to yesterday’s worksheet and read through your answers. Use what is already working well for you to eliminate some items from your long to do list. Use what you wrote down under what isn’t working for you to help you zero in on things you need to change or work on. Take you time, this is not a race. When you’ve got your three scroll on down to see what happens next. Got’em? Great! Click the pic down below to grab your copy of today’s worksheet and let’s get started with the fun part. 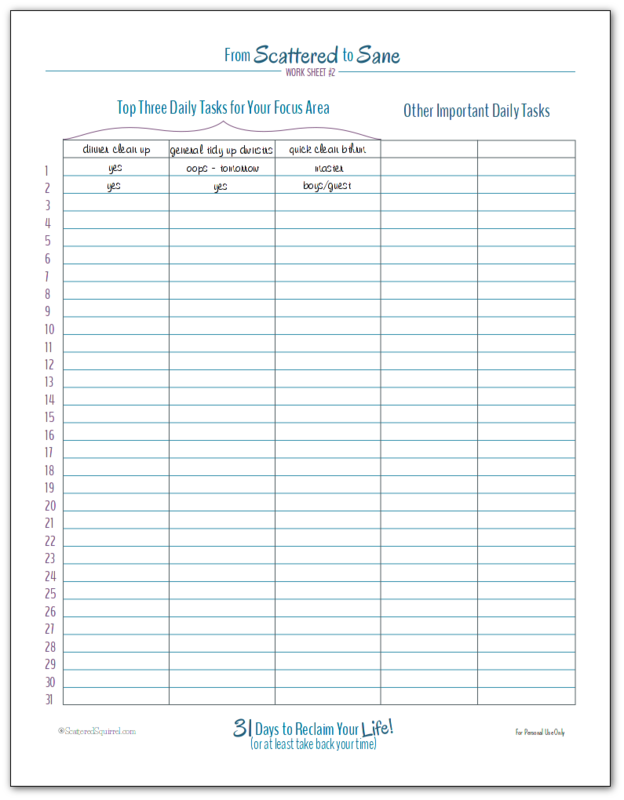 Fill out the top row of the form with your three item only to do list. I left room for other daily tasks you might want to add that aren’t in your focus area for those of you who need or want to focus on more. Here’s how I filled mine out. My focus area is my Home area. It’s the area that is first to start suffering when life starts getting crazy. And let me tell you, my little world got sent rocking recently and my home is certainly reflecting that. It would be one thing if I was the only one who had to live here, but I have to think about my family as well and they deserve a calm and peaceful refuge (and yes, I do to) so Home is where my focus is for this challenge. After taking a good long look around at what is and isn’t working on the home front, as well as taking some of my personal standards into the equation I came up with the following three item to do list. dinner clean up – this means dishwasher loaded and run, excess dishes washed, dried and put away, surfaces and sink cleaned, and the dining room straightened up. Even if I don’t touch a single dish all day long, this clean up time will get done EVERY DAY! And yes, I’m getting my family involved with the process. quick clean bathroom – with two and a half baths this is something that I need to do. My plan is tackle one per day and rotate through them. That is it! If I do nothing else for my home each day, I will do these three items. More than that, if I only complete these three items each day I will consider my day a success. You know why? Because we’re just getting started, and we can’t do it all at once. Fill out the top row of the form with your three items. Each row below represents a day of the month. Skip the first three days on this form. I made it so it could be used over and over if you want too. You can put a check mark, an ‘X’, or whatever you want under those days to mark off that you’ve completed that task. As you can see above I’m using words. Especially for the bathrooms, that way I just have to look at the sheet to see which one is next. I’m putting my sheet on my fridge and a copy in my planner. It may seem redundant but that way I’m seeing reminders all the time. Now I know that some of you are going to want to work on more than one area, and others might want to just focus on certain tasks that they need to do daily and forget about focusing on one area at a time. That’s ok. I’m a big believer in doing what works best for you. You know yourself best. For those that might want to put their own spin on things, I also made a similar worksheet for you. As always to get a copy of one of our printables for yourself, just simply click the pic of the one or ones you want. That doesn’t mean that I don’t have more fun stuff in store. There are other things we can be doing – quick little projects and maybe a few new planner printable to check out between now and the next step, so please don’t feel too rushed. Take your time to find your three items, and focus on getting those done each day! I’ll be back tomorrow with more fun stuff. In the mean time, drop me a line in the comments and let me know what your three things are. I’d love to hear from you. I do the same thing. Why is it we always have such high expectations for ourselves? I would never expect the same from the kids or my husband, or anyone else for that matter. Isn’t it crazy how three little things can keep live running smoothly for us? I’m morbidly obese, homebound, with an eating disorder. I chose losing weight as my focus. My three things are remaining binge-free, drinking water, and doing chair exercises. These are most likely very different than what the typical planner has on their schedule but it’s what I need to help. It’s not so much I have so much to do as I’m fighting severe depression and anxiety and I need the structure to help get me through the day. If I don’t, I end up escaping into a book or iPad all day. I need to feel more accomplished. 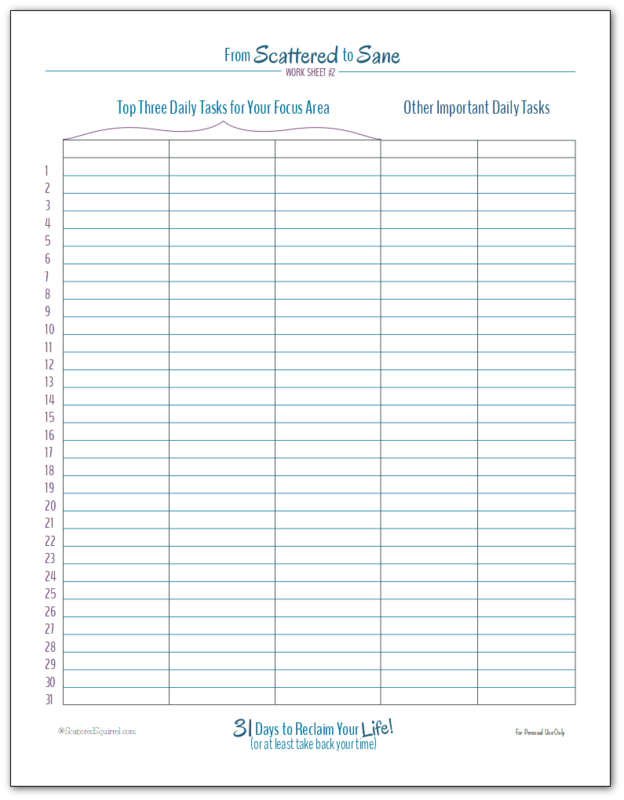 Nora, I love how you are taking this challenge and making it work for you and using the planner to make your life better. That is one of the best things you could do. I’m so sorry to hear that you struggling with depression and anxiety, I know it’s a hard road. Sending lots of positive thoughts your way! Hi Karen, welcome!!! I’m happy you found us. I’m thrilled to hear that you’re finding some printables and some posts that are helpful for you. 🙂 Thank you so much for taking the time to leave such a nice comment. I am a single mom of 2 and the area I need to focus on most is my home. I currently have 2 part-time jobs that I do from my home. I have stumbled across your website in my search to find the perfect planning system to fit my needs (especially Time Management). It is very hard to run a clean and orderly home, when you work 10 hours from your home and by the time the PAID work is done, there is hardly any left for cleaning when there is homework to help with and dinner to cook. I am really hoping this series helps me to not only prioritize my time for maintaining my home but still have some time left over for me to enjoy things that I like. Learning how to use the forms you’ve made will help tremendously and I thank you for sharing your tips and tricks! Hi Alita, I’m sorry I haven’t had a chance to respond before now. It sounds like you have a very full life. Being a single mom is tough work. I hope that you found some ideas in the series helpful. I am a single mum of young children who has been thru one hell of a year, but most recently I broke down because I just couldn’t handle everything I have to do each day along with all the emotional support my children need and my own emotional needs along with not being able to get any down time to just not think or do anything. I have always struggled to get into the right head space to do the every day tasks to keep my house running. I have been sitting on day three for a few days now and have found your three magic plan to work really well. but I think I didn’t make my list properly because I wrote down my daily routine and chose three things from it to do with the area of home. they where ‘get kids ready for school’, ‘cook dinner (including clean up after with my children’s help)’, ‘bed time routine’ (basically showers, book, goodnight kisses & cuddles) I found this didn’t need much work so I added tidy floors to my list. I also did the list for each of my children so that they had there three things a day to do and so far it has worked wonders I actually got to sit down last night for the first time in months to watch a grown up movie after the kids went to bed. I don’t have high expectations on having a tidy house but cant stand having a dirty house. I have to admit with yesterdays floor clean up I found a mostly decomposed apple in the toy corner witch is bound to happen at some point if you have kids ( apparently the dog put it there) witch brings me to my second list for myself witch I chose self improvements. That list consisted of ‘not getting angry when something goes wrong with the children'(positively tell/show them what the right thing would have been), ‘start saying yes to the children more’ (allow for more fun time and actually join in) and ‘take 5 to breath’. 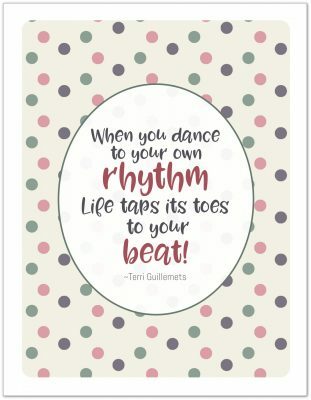 I have printed this one on an extra large page and put it in the centre of the house so that I see it every time I walk past it and it is amazing how much it has helped. I just want to say thank you and any feedback would be a great help. It sounds to me like you are doing just fine! I love that you took the idea of the three things and made it work for you, and I love that you’ve included your kiddos too. Making time to take care of you is super important, especially as a single mom. You need that time to recharge your batteries. My best advice – keep doing what’s working for you. It sounds like you’ve got a solid foundation to build routines on. It’ll get there. You’re doing a great job!! !